With the recent passing of Illinois Harness Racing Hall of Famer Mark Fransen our industry lost one of its true good guys at the much-to-early age of 64. The old idiom “Nice Guys Finish Last” certainly didn’t apply to the Mendota, Illinois native who trained over 700 winners in his home state including ICF Super Night champions Plum Peachy, Ideal Angel, Broadway Preview Buck and Wing, Andy’s Golden Boy and Dreams Made Real. Only Erv Miller and Joe Anderson had more Super Night trainer champions than Fransen’s nine winners. 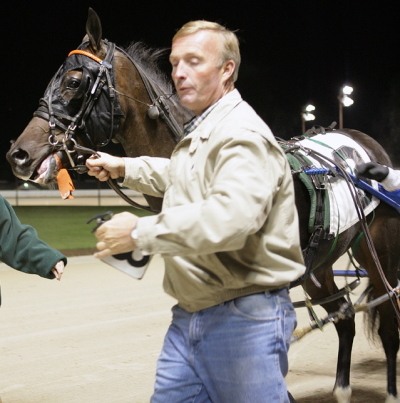 Trainer Mark Fransen with his Maywood Park 2007 Abe Lincoln stake champion Andy Roo. (REB Photo). In his five decade career as a horseman Mark rose to become a perennial top trainer on the very tough Chicago circuit and at the Springfield and Du Quoin State Fair meetings. At the same time the soft-spoken, well-respected trainer emerged as one of the genuine good guys in Illinois racing. Fransen took out his trainer’s license in the 1970s. His career blossomed in the 80s, and it took off in the 1990s with an assist from his good friend Illinois Hall of Fame driver Walter Paisley. Super Night was inaugurated at Sportsman’s Park in 1989 and one year later the tandem of Fransen and Paisley gave us an unforgettable September evening of racing when they teamed-up to deliver the only time sister and brother pacers that both captured Super Night crowns on the same program. First Paisley guided Plum Peachy to her $305,843 Orange and Blue Filly Championship, sewing-up 1990 Illinois Horse of the Year honors with a 1:56.2 mile, the third time that summer she broke the Sportsman’s track record for a 2-year-old filly. The Ideal Society filly out of the Nansemond broodmare Delightful Angel ended her freshman season with a perfect 7-for-7 record for Nettle Creek Standardbred Farm of Morris, Illinois. Later that night Plum Peachy’s 4-year-old full brother Buck and Wing won the $50,000 Dan Patch Final for Nettle Creek Farm and returned Paisley and Fransen to the Sportsman’s Park winner’s circle in front of a crowd of 15,499 who wagered (on-track) $2,333,038 on a nine-race card. Plum Peachy would notch a second Super Night victory the following year in the Grandma Ann Championship, the last season Sportsman’s was a five-eighth’s oval. Ideal Angel and Broadway Preview also delivered two Super Night championships for Fransen while Buck and Wing, Skipalong Misty and Broadway Creation were among Mark’s Springfield State Fair champions. 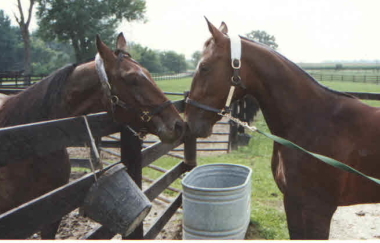 In 1990, the Mark Fransen trained pacers Buck And Wing (left) and Plum Peachy became the first and only brother and sister horses to win Super Night championships on the same program. (Pete Luongo Photo). It was Paisley who smoked-out Plum Peachy as a yearling and convinced the Nettle Creek boys (Brent Johnson, Steve Newcom and Don Stevens) to buy the filly ($27,000) at the Illini Yearling Sale and turn over the training duties to Fransen. “Back then I didn’t like to do a lot of training with 2-year-olds,” said Paisley. ”They take up a lot of your time. I thought Plum Peachy would be a good fit with Fransen. Mark did a great job with her and I knew early-on she could be a special filly. “Through the years Mark would ask for my opinion on his 2-year-olds after I qualified them or after their first baby race. There were times I had to tell him what he didn’t want to hear but that wasn’t the case with Plum Peachy. Paisley proved to be dead-on with his evaluation of the filly. Plum Peachy went on to prove best in 15 of 18 starts as a 2 and 3-year-old, typically ICF stakes, and hauled in $356,082. Just a couple of years later, Ideal Angel (Dave Magee) another daughter of Ideal Society, burst onto the local scene for Fransen and captured 8 of 9 races as a 3-year-old, ending with a romping eight-length triumph in the $182,000 Grandma Ann championship for owners Michael Dockendorf, Dave Andalman and Steve Zatkin. At the age of four Ideal Angel made it back-to-back Super Night victories by securing the 1994 Ann Vonian final for ICF pacing mares. Fransen was back in the winner’s circle on Super Night 1997 and again in 1998 at Balmoral Park when Broadway Preview nailed down both times the Dan Patch championships for older ICF pacers for Hunt Harness Horses of Big Rock, Illinois. Broadway Preview would win 54 races for Fransen and bank over $630,000 in 114 lifetime starts, mostly competing in ICF aged stakes and Balmoral Free For All events. On Super Night 2000, Andy’s Golden Boy (Tony Morgan) was victorious in the $220,000 Pete Langley Memorial for Fransen, who shared ownership of the 3-year-old Cole Muffler colt with Arch S Golden Stakes of Davenport Iowa. Two years later Morgan drove the Cole Muffler filly Dreams Made Real to her $255,000 Orange and Blue Filly championship for Fransen and his Illinois owners Michael Dockendorf (Chicago) and Nicholas Triantafel (Naperville). All together Fransen trained horses would earn nearly $7 million dollars and win 732 races in his Hall of Fame career, confirming again that “nice guys don’t always finish last”. Mike Paradise’s next column will be on Friday April 28. Mike’s handicapped lines and race comments, along with his stories, will be posted here every Thursday, Friday, Saturday and Sunday throughout the Hawthorne meeting starting on Thursday, May 2. Representative Mike Zalewski recently introduced a sports betting bill (HB3308) which also came with five different amendments. These different amendments were designed to get everyone’s position on the record for where they stood. We testified in front of the House Revenue and Finance Committee regarding HB 3308 and its five amendments. Of the five amendments, racetracks were included in four. The fifth one had no one included and was for the state lottery to run it all, with the state taking in all of the profits. Of the four good amendments, amendment number 2 had terrific language that we worked on last year that stated the racetracks must have a contract with horsemen before getting sports betting. That is the amendment we supported strongly. We mentioned that the other three that included the racetracks were good, but would need a tweak or two. This was the first significant discussion this year on sports betting and more are expected. Keep in mind, sports betting on its own, will not turn a big profit for the horse racing industry. The anticipated monies earned will not be enough to completely eliminate recapture or guarantee us a substantial increase in racing days. However, we need to stay relevant and every little bit helps. Currently, besides sports betting, we are also pushing for the state to reimburse the recapture money (about $2.3m for harness racing) that is owed us. We are working to get those dollars put into the Dept. of Agriculture budget so they can then be put into our purse account at Hawthorne. John Sullivan, the new director of Agriculture has been very supportive and is doing all he can to help. Also, we are hopeful that the extensive gaming bill, which would allow racinos in Illinois, will be reintroduced by the end of April. It is frustrating to watch this process move so slowly but history has shown us that something as controversial and major as a gaming bill will not pick up steam until May. Races will be held at the Illinois State Fairgrounds on Saturday, April 20th at 12:00 p.m. Conditions for the races are for Illinois bred 3-year olds and 4-year olds & up. Total purse payout for the day will be $50,000. Colts/fillies will race separately if at least 4 entries of each. Entries will be taken on Wednesday, April 17th. To enter, contact LeAnn Shinn by 10 a.m. at 618-783-2589. Horsemen can also enter online. Qualifiers will also be held. Entry fees for purse races and qualifiers will be $50 per horse. Scratched horses will be responsible for their entry fee. All scratches must be reported to race office in a timely manner. All horses need a negative coggins within 1 year and EHV vaccine within 6 months. If you have questions, please contact Tina Schrock at 217-416-0006. Sports betting at casinos and horse tracks? Our purse money from the Du Quoin State Fair has finally been paid by the Illinois Dept. of Agriculture. The check was sent and received at Hawthorne. The bookkeeper will begin cutting the checks and mailing them out within the next few days. Over the last several months the Illinois Dept. Of Agriculture has been working on a program that will allow you to nominate your horses to the various State and County Fair stake races with a credit card through an online service. They have completed the software and programs that will allow you to make your March 15th (and all nominations going forward) nominations online. The link can be found below. You will also find step by step instructions, through a series of screen shots, that will walk you through the process. If you need assistance please feel free to contact Carrie Tisckos at 217-557-4606.